By Mab, January 30, 2014 in Going Up! Houston may be getting more than a Super Bowl by the time 2017 comes around. 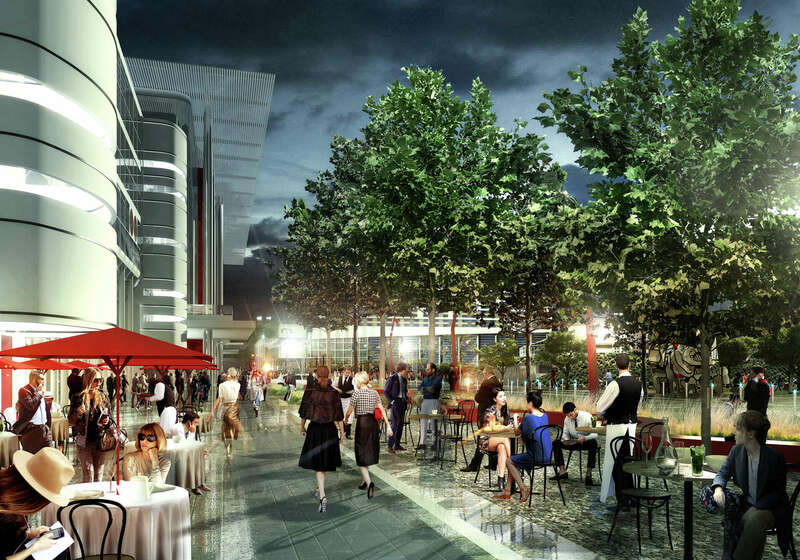 Representatives of Houston First Corp. are proposing to transform the George R. Brown Convention Center and adjacent Discovery Green into a landscaped and more pedestrian-friendly city center, with more retail and less car traffic. The renovation would bring more restaurants and a coffeehouse to the area and significantly curtail the street in front of the convention center to create a larger walkable area. It would be the area's biggest makeover since Discovery Green opened five years ago and leave its mark on the eastern edge of downtown long after the Super Bowl LI teams and their fans have departed for home. The project would be completed in spring 2016. 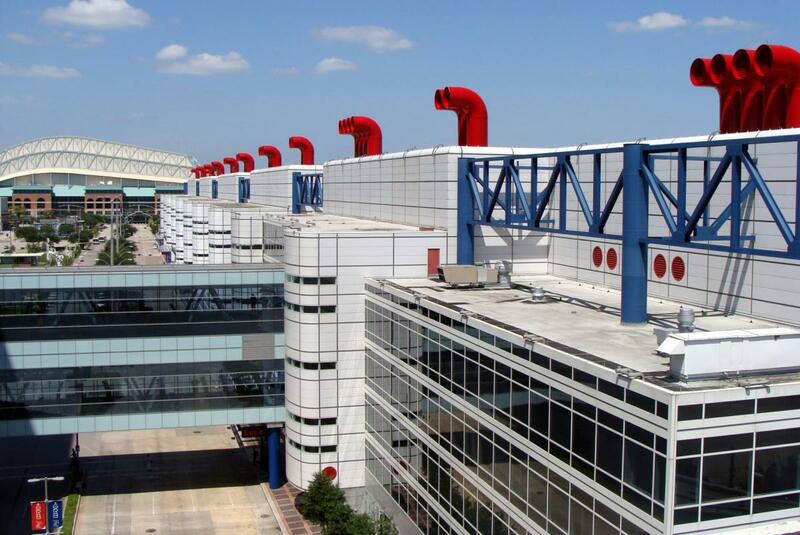 It would be funded entirely by Houston First, said Ric Campo, who chairs the quasi-governmental agency that manages the convention center and other city-owned buildings in the area. He also is chairman of the Super Bowl 2017 host committee. The street in front of the convention center, Avenida de las Americas, would go to about three lanes, from eight, and all lanes would close for special events. The eliminated lanes would be transformed into a landscaped pedestrian area with a row of trees and tables for sidewalk dining. On the block north of the convention center would be a 2,000-car parking garage and office space. Above it, a pad site would be built for a future hotel. The redesigned convention center would get a front entrance offering more transparency including panoramic views of downtown, said Marie Hoke, principal at WHR Architects, the project's lead architect. Houston First initiated the proposal. Campo said the project is still in the concept stage and no price tag has been determined. He said the Houston First board of directors has sole authority to approve or reject the project. ^ Very exciting. Knew this was coming. Exciting to see some preliminary renderings. Glad to see they are keeping some of the elements of the original design. Looks amazing! Only complaint is the mini big tex. Looks great, wish we could bury part of 59 to connect EADO and this area. There is simply NO WAY that will happen. LOL Hadn't noticed the mini big tex. That's a seriously bad idea and needs to be eliminated. I hope they budgeted $55mm for the Jeff Koons Balloon Dog in the first picture. Some very interesting information regarding the parking garage north of the convention center in the article, "On the block north of the convention center would be a 2,000-car parking garage and office space. Above it, a pad site would be built for a future hotel." While it will probably only be enough office space for Houston First Corp to house some of their operations, it is nice that the included it in the plan. Icing on the cake that they are going to build it to accommodate a hotel addition once the market dictates we need hotels completely encompassing GRB. Interesting that TC didn't do something similar with the 16 story parking garage they're currently constructing. Regardless, the Convention District is the most exciting part of downtown with new development popping up almost every week it seems! Very cool, I like it a lot. I'm glad they didn't change the character of the GRB because I actually do like it. Hope this happens...soon. It's be nice if they could fit it into the final four plans at least. Oh wow this is awesome. Can't wait! Did the article mention anything about the hotel being on track? It looks like the Chronicle has figured out a way to elude my google searches. I think we knew about that parking garage... but we didn't know about the future office and hotel, right? Feel free to merge this thread if need be. Applications for this project are due tomorrow. This is run by private company men. It will be done by the final four. Also, the hotel is planned to be 14-20 stories and the garage part facing the street will look like an office building, not a garage. Yep, the hotel on the garage site is new. Threads merged. Since the project does include a hotel, I've pulled this one into the Going Up section. I mean, did the article say anything about the RIDA hotel? I haven't been able to see the whole article either, so I have no idea if it mentioned the RIDA hotel (Marriott Marquis), but it is definitely on track. Currently, buses and cabs pull up to the front of convention center along Avenida de las Americas. But with the proposed project, buses would pull up to parking areas on the north and south ends of the convention centers and cabs would pick up and drop off in front of the Hilton Americas and the Marriott Marquis to be built nearby. The Marriott Marquis will have a street-level sports bar with some of the largest TV screens for sports viewing in the city, said Ira Mitzner, president of RIDA Development Corp., the hotel's developer. Mitzner described the overall plan as "transformational" that "will create a great friendly walking district" that intersperses event and hotel space with parks, sporting venues, retail and, eventually, the Nau Center for Texas Cultural Heritage. Edit: That is the only mention of RIDA in the article. Wow, this is a class act. Loving it. I still say they should build a top golf and public sports complex on the roof for the urban dwellers.. But I'm digging these plans. FInally getting the city we always dreamed of, great planning by the city! Not to be a downer, but when I see shovels in the ground for this and the Marriott, then Ill be happy, until then Im just hoping for the best. And from what the HBJ reports this is supposed to break ground in April with the Marquis? They lump them together, but that is great news that they are getting things together so well! Thanks Triton, and agree with cuevas. So giant screens playing sports visible from street level are allowed, but jumbotrons arent. opening the grb to panoramic views of downtown houston, shall be a state of the art... and yet novel approach. the new hotel on top of the garage / tower shall be the official icing upon the cake. 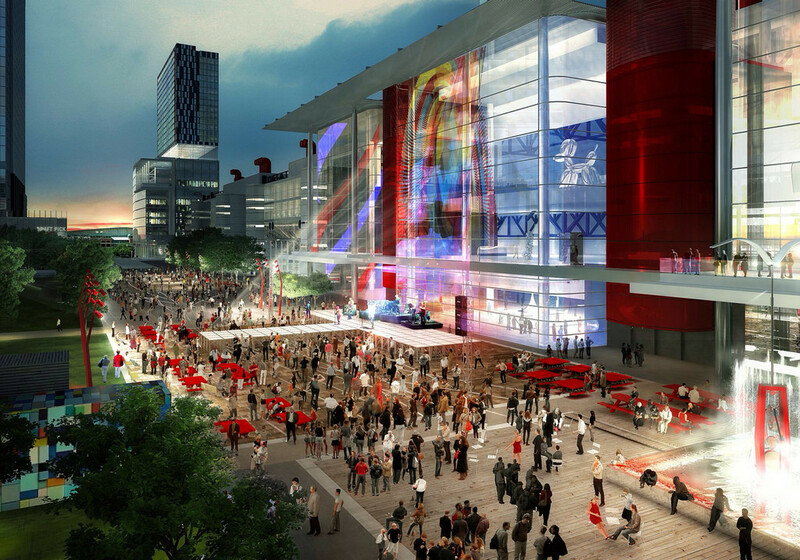 this new concept as per the grb... shall catapult downtown houston into the tourism stratosphere. oh boy, it's on! Anna Wintour seems to be enjoying herself. There's a lady in Deerbrook Mall that will make them for $5 per. Lol at Anna Wintour. I mean really? That north block has been earmarked for parking for a long-time; nice to see them think of using the airspace for a hotel. Even with the four new nearby hotels planned to come onstream in the next few of years (Hampton Inn, Hyatt Place, Marriott, Green Street) I think that the GRB still might be only on the cusp of having enough nearby hotel rooms to support really large conventions. I like the idea of narrowing Avenida de las Americas and using it somewhat for public space. I might add, though, in a tiny little voice, that as ever I have some reservations about remodeling; specifically glazing a large chunk of the GRB facade. Yeah, yeah, it looks all modern and cool and stuff, and I recognize that the GRB has never been exactly beloved from an architectural standpoint. 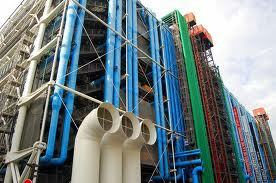 When it was first built a lot of people, myself included, thought it was a bit of a white elephant. However, after a quarter century I think it seems to have come into its own as a nice example of 1980s post-modernism. Building Discovery Green, for whatever reason, really helped how it fit in with the environs, compared to the previous sea of surface parking. I can live with refacing Two Shell because I don't think it is of any particular architectural merit, but GRB is different. Oh well, in twenty years, when Houstonians are decrying how we let ourselves deface such a perfect example of 1980s architecture, I'll log in from the old folks home and say "I knew it!" I too have mixed feelings about the GRB. I don't know about the materials used, I dont know about the Ship references (color, shape, and smoke stack things), but with all that said - it isn't bad or offensive. I think this proposal would be great if they could ensure they don't ignore the building's existing features... I tend to not like buildings if they have parts from different eras and it is obvious. But the if the GRB can still look like a seemless, complete package after the work is done, I think it is worth the risk..
That's the thing though. How can they not ignore the building's existing features? After they graft on a new facade how can it look like a seamless, complete package? I'm not saying GRB is one for the ages, but it's a really good period piece, the best in Houston, so it's a shame to mess it up. ugh, now I am critical about it. I have to disagree sub. It is extremely post modern but certainly not the best example. You might be right, later down the line we might regret the upgrade, but not for a few more decades. I think it'll be fine as long as they don't touch the other side of the building facing 59. Have you ever heard anyone say, "My jaw dropped when I saw the George R. Brown Convention Center?" Have you ever heard that sentence? This is not meant to express an opinion on whether it should be altered, btw. I just thought it was a funny sentence. Well, not in a good way, no. Look, I didn't say that it was a prize piece or the best example of the style one could find. But it is a pretty decent and emblematic example of post-modernism, certainly one of the best in Houston (along with Bank of America) that has survived this long. If it were the Wortham Theater, for instance, which looked dated the day it opened, I'd yell "Remodel away!" But does a structure need to be best-in-class to merit preservation? Of the list of 1960s "modernizations" that I posted in the Two Shell topic, I doubt that any were considered prime examples of their respective genres. Some, like the West Building, I would categorize as positively dumpy. Still, what replaced them was in almost every case worse and ultimately detracted from the economic value of the buildings and the architectural character and heritage of Houston. Again, I'm not saying that every remodeling is a mistake, just most of them. I'm just afraid the GRB would fall into the latter category. I think what makes the remodel attractive is I don't see the color blue. Mixing Red, White, and Blue is very hard to pull off, and eliminating it brings it up to speed. I'm happy though they are keeping some of the elements of the original design (As I said before). The current glass wall on the GRB is pointless, it opens up to a blank wall on the inside, and this redo makes it flow. You are right that very few renovations are seen long-term as improvements. I disagree about the Wortham, I've always kind of liked it, and it got some good national reviews when it opened. And the George R. Brown isn't terrible, there's actually a rather flattering photo of it on wikipedia. But I think convention centers are pretty much destined to be transformed, reshaped, repurposed. They're just way too big and pragmatic by nature to ever be given the amber treatment as period pieces, much like airports or perhaps sports stadiums. Plus, this renovation leaves much of the original 80's facade intact, and it's not like you need the whole thing left intact to get the point, the front facade has that sickening repetitiveness and a-centeredness that one normally associates with college dorm hallways. We'll have a section of 80's style and a section of 2014 style, it'll be like one of those Gothic cathedrals that was built and reworked across different periods! I've been in both buildings more than once, and the similarities (and differences, too) have always struck me. 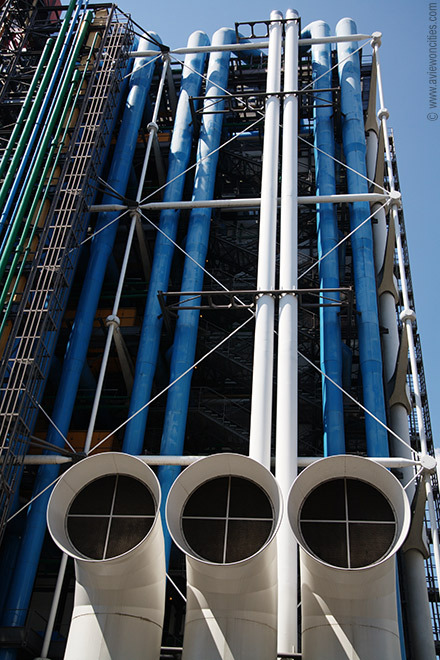 I've heard the Pompidou Centre described as resembling an oil refinery or a building turned inside-out, with the ductwork being exposed on the outside and painted bright colors. The GRB has similar ductwork, but it is mostly in the lobby, as I recall, not on the outside. OTOH, the exteriors of both buildings are painted with bright primary colors and have ventilation ducts that are very ship-like. When GRB was built, I had already seen the Pompidou Center and immediately saw that the latter had influenced the people who designed the former. I couldn't find a pic online of the GRB lobby, which has lots of brightly colored ducts. But, at least the 2 pics I attached here show the "ship smokestacks" they both share. Improvements to the GRB will begin later this year (4Q 2014), construction on the new garage will also begin around that time.